Chris Kinsey is one of our finest Nature Poets. In 2008 she won the BBC Wildlife Poet–of the–Year competition for a poem about a tree–creeper. Her work with rescued greyhounds has earned her the nick–name of the greyhounds’ poet laureate. 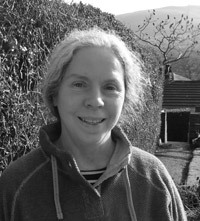 But as the poems in Swarf reveal, Chris Kinsey is also interested in human nature, especially among those whose lives are easily overlooked and under–valued – many of these poems draw on her experiences working with the elderly, with excluded students and adults with learning disabilities. It is a book about life in a small town, its mad Fridays, slow Sundays and long afternoons in the pub. It is a book of poems about living and learning, about hospitals, park–life, martial arts – and greyhounds. The slightest sniff makes your muscles ripple. then you soften and move like quicksand. A kingfisher flies low, close to the bank. on a spillage of turquoise. flutters into a wrap–around skirt. A wolf–whistle shrills afternoon silent. with noughts and crosses on his neck. The woman grins, but he frowns. 'She's been spayed.' I say. just a bit of lamping. as rabbits white–tail into hard earth. I open my arms and call with all my lungs. pressing like a strong current. tacking the Arctic down latitudes. Pumlumon raises a white brow over the source. We sit still, mulling the rumours. so I had a bath and lay on the bed. Never come round for five days. went right down my throat. Chris Kinsey's previous books are Kung Fu Lullabies and Cure for a Crooked Smile. 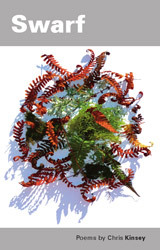 Her stage play, Feathering the Dark was shown at Aberystwyth Arts Centre and her short play, I and I at Venue Cymru. She writes a regular Nature Diary for Cambria and was runner–up in Natur Cymru's 2010 'Inspired by Nature' competition. She is a member of Academi and Powys Arts Forum. She lives in Mid–Wales.